Pink Floyd's The Wall (1979) is one of the best-known concept albums of all time. 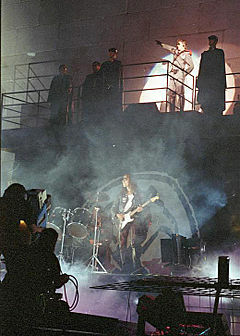 Pictured is Roger Waters leading a 1990 performance of the whole album. This page is based on the Wikipedia article Concept album; it is used under the Creative Commons Attribution-ShareAlike 3.0 Unported License (CC-BY-SA). You may redistribute it, verbatim or modified, providing that you comply with the terms of the CC-BY-SA.